The Space HamstersTM Animated App is now available on iTunes! The Space HamstersTM animated story and educational solar system game app explodes with color, comedy & interactivity. Cute characters, cool music and exotic animals set this app apart from the rest. But most importantly, 1% of net proceeds go to animals in need! With 17 years of production experience, Jennifer Erwin has been involved in many facets of the entertainment business, producing a variety of award-winning and industry-changing television series. Her experience includes working at the executive level for international broadcast networks, as well as working as an independent producer. After graduating from UCLA, Jennifer began interning for ICM at the Cannes Film Festival. Shortly after, she landed a full time job at the William Morris Agency in the talent department. It was this experience at William Morris that helped Jennifer determine that production was where she wanted to take her career. She left the agency and began assisting the Executive Producer of VH1’s Behind the Music. After convincing the network to produce a Duran Duran episode, she was promoted to Associate Producer. After five years at MTV Networks and producing two award-winning series, she received a call from NBC to work on a new “reality” show entitled Fear Factor. Just as reality television was emerging, Jennifer already had years of story-telling and documentary film-making experience behind her, so moving on to large scale broadcast network shows was a natural move. After many years of producing and developing memorable programs, such as America’s Next Top Model and Paradise Hotel, she became the Director of Development for UPN and CW networks. Jennifer spent three years at the networks developing and overseeing the hit shows America’s Next Top Model and Beauty & The Geek. With a strong interest in scripted film and television, she left the network to pursue that passion. Immediately she obtained the rights to the best-selling book about America’s first FBI profiler entitled, Mindhunter. After bringing the book to Charlize Theron’s attention, the project quickly found a home at HBO. Erwin will serve as Executive Producer alongside Theron and David Fincher, who will also direct the pilot (http://www.variety.com/article/VR1118014379?refCatId=14). After building a slate of features and scripted TV projects, Erwin started Jen X Productions, Inc. in 2008, an homage to her Gen X generation. Out of the gate, Jen X produced two pilots and currently has projects in development ranging from thrillers to animated apps for children. Recently, Jennifer partnered with San-X, Co. Ltd., and obtained the master licence for one of their adorable characters, the Space Hamster™. The brand launched in June of 2012 at the Licensing Expo in Las Vegas with a mulit-faceted iOS animated application and apparel line. The next phase in Erwin’s career will be focused on the Space Hamster™ brand and launching an animated television series centered around the characters. 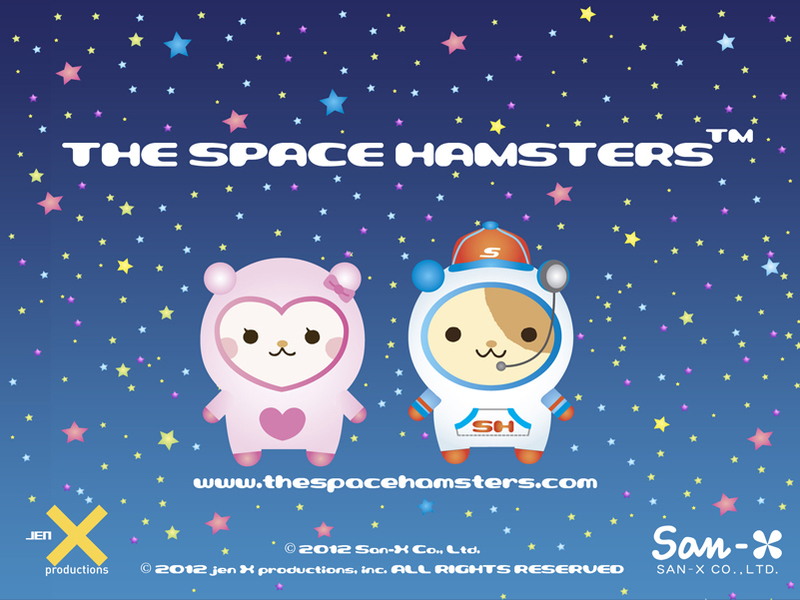 August 2012 – San-X Co., Ltd., one of the largest character-oriented manufacturers in Japan, and Jen X Productions, Inc. are thrilled to announce that The Space Hamsters™ animated book and game app is now available on the iTunes App Store. The Space Hamster brand was launched earlier this summer at the International Licensing Expo and the game app is the first opportunity for children to experience interacting with the Space Hamsters up-close. Appropriate for ages 2-8, the new app is an effective tool to entertain and educate children about the solar system and caring for animals, while also improving hand-eye coordination. The new Space Hamsters™ iOS app is one of the first products that give users a glimpse of the loveable characters and their Hamster homeland---outer space. The two-in-one interactive app introduces the backstory of the Space Hamsters and their mission here on Earth, which includes rescuing pets and acting as ambassadors to all animals of the world. Kids are encouraged to explore the story by touching the characters and objects on screen to generate movements and sounds. After reading the story, kids can play Solar System Safari and rescue missing safari animals in outer space by matching planets correctly. In addition, to honor the Space Hamster’s work, Jen X Productions will donate 1% of net proceeds to a variety of animal-based charities, creating a 1% For the Animals charity fund. About Jen X Productions, Inc. 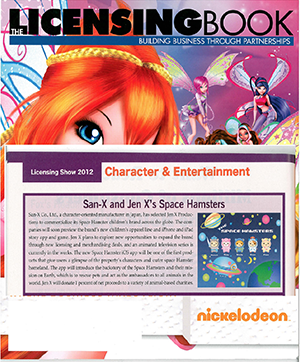 Founded by television producer Jennifer Erwin, Jen X Productions, Inc. officially launched the Space Hamster™ brand at the Licensing International Expo in June 2012. The Space Hamster App is the first of many opportunities that Jen X will be exploring to expand the Space Hamster™ brand through an extensive merchandise-licensing program. There are also plans to develop a children’s animated television series based on the Space Hamster™ characters. With 17 years of production experience, Erwin has been involved in many facets of the entertainment business, producing a wide variety of TV series and has worked for every major broadcast network, including CBS, CW, NBC and HBO. San-X is one of the largest character production goods companies in Japan, specializing in stationary, home goods, and gifts. The company was founded in April 8th, 1932. Since the 1980’s, San-X has introduced more than 800 characters into the market, including characters such as Rilakkuma, Tarepanda, and Afro Ken. These unique characters have struck a chord with fans, not only in Japan, but also throughout the world. San-X will celebrate its 80th anniversary in 2012. The four-leaf clover logo symbolizes San-X’s continued hope for “good luck” while sharing happiness to the rest of the world. Contact Jen X Productions, Inc.
� Copyright 2012, Jen X Productions, Inc. All Rights Reserved.